Dana is a Sanskrit and Pali word meaning generosity or giving. In Buddhism, it also refers to the practice of cultivating generosity. 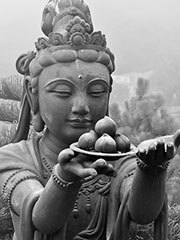 Ultimately, the practice culminates in one of the Perfections (paramitas): the Perfection of Giving (dana-paramita). This can be characterized by unattached and unconditional generosity, giving and letting go.